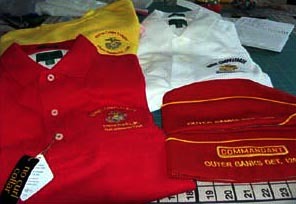 Custom embroidery and Outer Banks Detachment shirts are now available through Joanne Sulik, wife of one of our members. Joanne has been doing custom embroidery work for some time and offers quality work and materials at excellent prices to our members. Members desiring to have their covers embroidered must provide the cover to her as it is not included in the price. Joanne will provide the shirts and would prefer to have several orders at one time (so she gets discounted shipping) and a single check from the Detachment. Interested members should contact our adjutant to place orders. Orders should specify item(s) ordered, size(s), color(s), and quantity. Payments are to be made at the time the order is placed. Once we have accumulated orders for at least three items, we'll place the order with SJSews and make the necessary arangements to get your order to you upon completion.